Can ‘nudge’ theory help extend working lives? Government policy in the UK and other industrialised countries aims to increase the numbers of people staying on in work for longer – but there are significant differences between different groups. Can social and economic factors explain them? Or is there truth in the suggestion that some groups of workers are ‘resistant’ to staying in work, particularly in poorer areas? Nicola Shelton and colleagues from UCL looked at regional differencesin extending working lives and found policymakers may need to rethink their approach. Despite the government’s stated desire for longer working lives, many workers still stop working before state pension age. The proportion of 60 year-olds in work in England and Wales is 20 per cent lower than the proportion of 50 year-olds, according to 2011 census data. And this drop in work participation rates isn’t uniform: Existing research tells us those with lower educational qualifications – particularly women –are more likely than others to leave work early. So, why might that be? Some official publicationshave suggested there may be resistance to continuing in work among some groups– perhaps in areas where there are fewer professional or skilled jobs, and where levels of deprivation and unemployment are high. We wanted to find out more about this: what regional differences are there in the age at which people leave work? Are there gender differences? Are there particular factors – working conditions, household or individual factors – which can promote extended working lives? And if there are, how do they affect any regional variations? There is some previous research on the subject. A studyusing the ONS Longitudinal Study(ONS‐LS) and the English Longitudinal Study of Ageingfound those in lower-grade jobs, those previously unemployed, those with health problems and those with no dependent children tended to stay longer in work, along with women from Pakistani or Bangladeshi backgrounds and single women. The study included just two areas, comparing the South, East and Midlands with the North of England and Wales. Similar evidence exists from other countries – In France, Norwayand Great Britain, links have been found between unemployment and deprivation and retirement rates. We used census data – a one per cent sample of the total population – to look at what happened to adults who were aged between 40 and 49 in 2001. This ONS‐LS data covers more than 33,000 women and just under 32,000 men who were therefore aged 50-59 in 2011. We found men in the North East were significantly less likely to extend their working lives than others. Those in the South West and South East were 1.6 times more likely to stay on than those in the North East, in the East of England 1.5 times, and in the East Midlands 1.4 times. Women in all regions apart from London and Wales were significantly more likely to stay in work than those in the North East, with figures ranging from 1.15 times in the North West and West Midlands to 1.6 times in the South West. But when we did further analysis, we found that for men at least, other social factors could explain these differences. Put bluntly, the reason men in the North East leave work earlier is because they tend to have fewer qualifications and less favourable employment status – both of which are associated with shortened working lives. When we did the same analysis for women, we found some additional factors which affected their likelihood of staying on in work. Those in lower-skilled jobs were less likely still to be in work by 2011, along with those working for larger employers. Those who worked away from home were also more likely to have left, along with those who worked long hours. And again, – when we considered these factors along with prior employment, health, social status and caring responsibilities, and only those in the South West were significantly more likely to stay on than those in the North East. So, what can governments do? Given a good work environment, choosing to remain in work may have positive benefits such as maintaining good health and functioning and providing a sense of purpose- so working conditions are important. The biggest single factor in determining whether workers stay on for longer is prior employment – and that is not likely to be changed by behavioural approaches such as the ‘nudge’ theory of behavioural economics which is popular with policy makers. Policies that do not address issues such as low levels of education and high levels of unskilled employment can only be partially successful in enabling people to work for longer. Indeed, some groups who may have the most financial need to remain in work are most likely to leave earlier. This is particularly an issue for women. Policies that increase skills and education in later life, rather than simply targeting those ‘receptive’ to extended working, will be more likely to make a difference. Gender differences and individual, household, and workplace characteristics: Regional geographies of extended working lives, is research by Nicola Shelton, Jenny Head, Ewan Carr and Paola Zaninotto, and is published in Population Space and Place. This entry was posted in Journal article and tagged Census, English Longitudinal Study of Ageing, Extending working lives, Gender, ONS Longitudinal Study, Retirement, Unemployment, Work on February 18, 2019 by Chris Garrington. Working with a long-term illness – does employment status make a difference? Across the developed world, a growing share of the population suffers from chronic disease such as diabetes, arthritis or heart problems – in the EU, around 45 per cent of those aged 55-64 had such a disease in 2015. And that affects their ability to work: just half of those with chronic illnesses are employed, compared to three quarters of those without. But how do the self-employed cope with such conditions, when compared with those in employment? Maria Fleischmann and colleagues from the RenEWL project find these differences in work status can make a major difference. We know that when people become chronically ill, changes in their working conditions can help them to continue working. And we also know that good working conditions – being able to control how you use your time and how you do your job, whether you make the decisions and whether you feel valued, for instance – can help all of us to stay in paid work for longer. And of course, if you become ill you’re more likely to feel the need to take time off or maybe to give up work altogether. 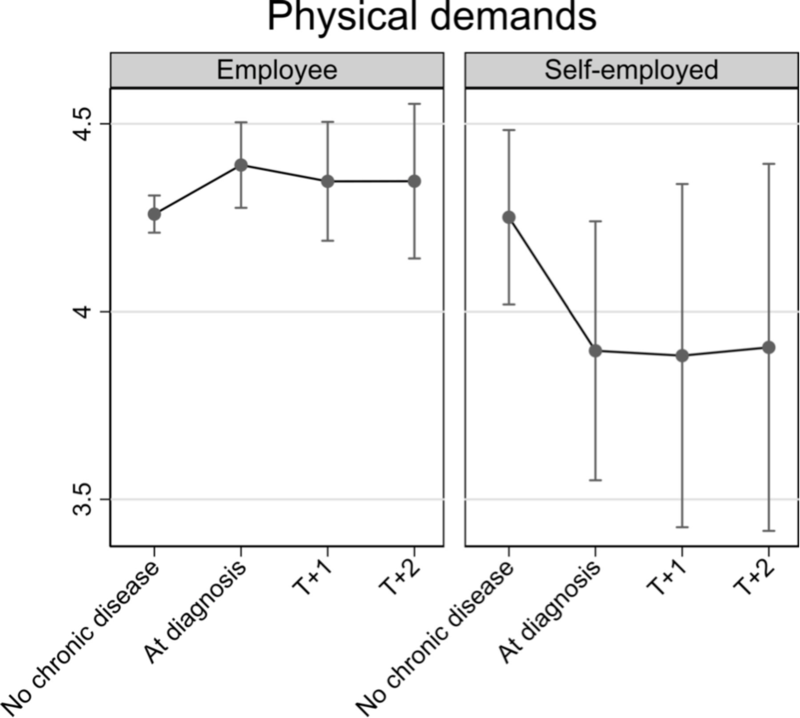 We wanted to compare how the employed and the self-employed adjust their working conditions when facing a diagnosis of chronic disease. Existing research tells us that many older people work for employers, and have to ask for their approval when it comes to making adjustments to their working conditions. The self-employed, meanwhile, are much more able to make their own decisions and tend to feel they have more control over their working lives. We looked at people’s ability to control their work: physical demands, working hours, psychological demands such as how fast they had to work, and social aspects such as whether they felt valued. And we had a great source of data for this – the English Longitudinal Study of Ageing (ELSA), which has followed a total of almost 9,000 over-50s since 2002. From that group we were able to find and study 1389 participants who reported no chronic diseases when they were interviewed in 2004-5 – the second wave of interviews – and who were in work. We were then able to look at what happened to them before the seventh wave of interviews, in 2013-14. A little over 40 per cent of our sample were in managerial or professional occupations, a quarter in intermediate occupations, and almost 30 per cent in routine and manual occupations. At each interview, respondents were asked whether they had been diagnosed by a doctor with lung disease, asthma, arthritis, cancer, high blood pressure, diabetes or high blood sugar, stroke or heart problems. During the study period 510 of the 1389 sample members were newly diagnosed with one of those conditions. We were able to look at how they fared at work for four years after that, and we found some striking differences between how the employed and the self-employed seemed to have been treated. The physical demands of our participants’ jobs were pretty similar before their diagnosis, for instance. But afterwards significant numbers of those who were employed said that those demands had actually increased when they were diagnosed. The self-employed, meanwhile, told us the opposite had happened to them – they reported significantly lower physical demands at work immediately after diagnosis. This effect continued for some time, though it grew less pronounced. How could that be? We think maybe the increase in physical demands among the employed could be due to perception – similar demands might be perceived as more strenuous by the chronically ill. The self-employed, meanwhile, have more freedom to adjust those demands when they feel they need to. The self-employed reported that their working hours dropped by an average of 2.8 hours per week on diagnosis, while those who were employed did not see a change. This effect was not statistically significant, though. Employees found that their level of autonomy at work also dropped marginally, while for the self-employed there was no significant change. We did not find any major changes in psychological or social conditions in either group. So, what did we learn? Essentially, that improvements in working conditions after diagnosis of chronic illness were restricted to the self-employed. So employers may need to ask themselves some hard questions – do they want to hold on to workers who become unwell? If they do, then they should consider the levels of flexibility they offer, and they should think about making adjustments for those workers if they don’t want to lose them. In an ageing society, older people are expected to work ever longer and therefore to remain at work even when they begin to suffer from health problems. Our findings should also encourage policy-makers and governments to think about how chronically ill older adults are treated at work. Changes in autonomy, job demands and working hours after diagnosis of chronic disease: a comparison of employed and self-employed older persons using the English Longitudinal Study of Ageing (ELSA), by Maria Fleischmann, Ewan Carr, Baowen Xue, Paola Zaninotto, Stephen A Stansfeld, Mai Stafford and Jenny Head, is published in the Journal of Epidemiology and Community Health. This entry was posted in Journal article and tagged Ageing, Arthritis, Asthma, Cancer, Chronic disease, Diabetes, Employment, English Longitudinal Study of Ageing, Flexible working, Health, Heart Disease, Lung disease, Occupational health, Retirement, Stress, Well-being, Work on August 20, 2018 by Chris Garrington. Having a family – how might the decision affect the length of your working life? Across the developed world, people are living longer. In response to this, governments are looking for ways to encourage people to work for longer. In the UK, the State Pension age is being raised and future generations will have little choice but to work. But how will the decisions they made earlier in life – whether and when to have a family – affect their later employment prospects? A new study from the RenEWL project by Dr Mai Stafford and colleagues at UCL and Queen Mary University of London has some answers. Many of the post-war baby boom generation retired before the State Pension age began to rise. But subsequent generations must plan for longer working lives, and government policy needs to find ways to facilitate that. We know more people are living longer, and we know that our decisions about having a family can affect the likelihood of us staying in work for longer. But we wanted to get a more nuanced view of how family and working lives can interact. Would those who delayed starting a family until their thirties be more likely to work into their late sixties? How would those who never had children differ from those who did? And how would the prospects of women who took time out of the workplace be affected by that decision as they neared State Pension age? We looked at data from the MRC National Survey of Health and Development (NSHD) which has followed the lives of more than 5,000 people born within a single week in 1946. Participants have been studied 24 times during their lives from birth, through childhood and adulthood, and most recently when they were aged 68-69 – at which point more than 2,700 people responded. The men in the study reached state pension age at 65; the women at 60. We found that almost half the men had been continuously married with children and in full-time work since their early twenties. Women’s lives tended to vary more, with the largest group working full-time until their early twenties then taking time out to raise a family before working part-time and then returning to full-time work in their late thirties. In their early sixties, just over two thirds of women and a third of men were not in paid work. Women who did work at this age were more likely to be in part-time work, while men were more likely to be in full-time work. By the age of 68-69, just one in five men and one in 10 women were still in paid work. Those who became fathers in their early twenties and who had jobs were more likely to be in full-time work at age 60-64 than men who remained single and childless. They were also more likely to be in work at age 68-69 than men who had partners and jobs but no children. When we looked at how the age at which participants had their children affected their later employment, we found this made no difference for men. But women who had children later were more likely to be in full-time work at age 60-64 than those who had them earlier. Having children early then returning to full-time work after a break, rather than continuous work through the childrearing years, made no difference to women’s later employment prospects. We considered whether these differences might be driven by earlier health and socioeconomic circumstances that result in different kinds of family-work patterns. The links between work-family patterns and later life work participation remained when we statistically controlled for childhood health, educational attainment and childhood socioeconomic factors. Why did the age of family formation make a difference? Women who have their children later may still be providing financial support to them in their sixties – though if so we would expect that men who had children later would also be more likely to be in paid employment, and this was not the case. Women who became mothers later may also have started working later – possibly because they stayed in education longer – and therefore might have accrued less pension entitlement by age 60-64, though we do not think this fully explains the difference because we controlled for educational attainment. So, what can this cohort of British baby-boomers tell us about how family decisions affect later working lives? We found that the timing of having children was related to women’s but not men’s employment in later life. Both men and women who remained childless, regardless of whether they had a partner, were less likely to be in paid work in their sixties than those who had children. And both men and women who worked full-time and neither had children nor a partner were also less likely than their peers to be still in paid work after the age of 60, though women in this group who were still working were more likely than men to be working part-time. Mothers who returned to work were more likely to be in work in their sixties, while becoming a father made no difference to a man’s prospects. It’s important for policymakers who have an interest in extending our working lives to consider these results. Mothers, and parents more generally, may stay in the work-force in later life if they have access to jobs which allow them to combine family and work. Our study underlines the need for both part-time jobs and flexible working to be available to parents. Work–family life course patterns and work participation in later life is research by Mai Stafford, Rebecca Lacey, Emily Murray, Ewan Carr, Maria Fleischmann, Stephen Stansfeld, Baowen Xue, Paola Zaninotto, Jenny Head, Diana Kuh and Anne McMunn and is published in the European Journal of Ageing. This entry was posted in Journal article and tagged 1946 Birth Cohort, Ageing, Career, Employment, Family, Flexible working, Health, Pension, Retirement, State Pension Age, Work on April 16, 2018 by Chris Garrington. Working after retirement age: who benefits? Recent reforms have made it unlawful for employers to force their workers to retire. So what are the reasons why some people stay on after state pension age while others choose to leave? How do those decisions affect quality of life for those who stay, and for those who go? A study by Giorgio Di Gessa and colleagues at King’s College London and the University of Manchester sheds new light on the issue. We know that more of us are working after we reach retirement age – but until now we haven’t known much about how people make that decision, or about what effect it has on their sense of wellbeing afterwards. In our research, we used English data from a panel study of older people to find out more about who chooses to stay on in work and why. We then went on to ask whether those who chose to work felt differently about their lives when compared with those who felt they had to work. We took a representative sample of 2,500 men aged 65 to 74 and women aged 60 to 69 who had previously been in work, and we found one fifth of them still had paid jobs. Of those, two thirds had chosen to continue to work because they enjoyed their jobs or because they wanted to keep fit and active. The other third said they worked for financial reasons: either they couldn’t afford to retire or they wanted to improve their pension provision for later. We placed the retired respondents into three groups: Those who had had a ‘normal’ retirement when they became eligible for a state pension (28 per cent), those who felt they had to retire because of ill-health or redundancy (2 per cent); and those who retired voluntarily – because they could afford to do so or because they wanted to spend more time with their family, for instance (28 per cent). On average, those who had retired experienced a lower quality of life, when measured on the CASP-19 scale for older people. The highest quality of life was reported by those who had stayed in work voluntarily, while the lowest was reported by those who had retired involuntarily. The gap in quality of life between these two groups is similar to the one observed between respondents who said they had a long-standing illness and those who did not. As expected, respondents who were financially better off also had higher quality of life scores. When we considered changes in these CASP-19 scores over time, we found that on average people experienced a drop in their quality of life over a six-year period between two ‘waves’ of the study: about a quarter experienced a decrease of 5 points or more whereas just over 16% experienced an improvement of 5 or more points. Those working voluntarily experienced a slight increase in their quality of life when they eventually retired. On the other hand, the wellbeing of those who were working out of necessity did not improve after retirement. As one might expect, the scores improved among those whose health got better after retirement, and worsened among those whose health deteriorated. It’s worth noting that our study sample is skewed towards the more advantaged – the proportion with no qualifications is significantly lower than in the census. It is therefore likely that our study underestimates the percentage of people who work out of financial necessity. What does our study tell us about working after retirement age? In particular, it reminds us how important it is for people to feel they have control over these key decisions about their lives. Those who continue working because they have to have lower quality of life than those who continue working because they want to – and even once those people have retired, this wellbeing gap is likely to persist. We know that people who experience a higher quality of life tend to be healthier and to live longer. Government initiatives aimed at helping workers maintain control over their decisions are worthwhile – but policymakers should also consider how people might be given more support throughout their lives to protect their financial and personal wellbeing if they do have to work for longer. The decision to work after State Pension Age and how it affects Quality of Life: Evidence from a 6-year English panel study is a research paper by Giorgio Di Gessa of King’s College London, Laurie Corna of King’s College London, Debora Price of the University of Manchester and Karen Glaser of King’s College London. It is published in the journal Age & Ageing. This entry was posted in Journal article and tagged Ageing, Employment, English Longitudinal Study of Ageing, Health, Mental health, Pension, Retirement, State Pension Age, Well-being, Work on April 3, 2018 by Chris Garrington. Working for longer is something we are all having to get our heads around. It’s certainly a priority for the Government, which wants to encourage more older people into satisfying jobs that will help them stay happy and healthy as they age. For older people already in good jobs that they enjoy, who have been fit and active for most or all their life, this could be a great opportunity for them and their families. Of course that’s not the case for everyone. Dr Charlotte Clark has been looking at what having poor mental health as a child could mean for our working life in our mid fifties. Here she explains why policy makers and businesses need to pay close attention to the mental wellbeing of the nation if they want to extend people’s working lives successfully. Working beyond traditional retirement age has been the focus of much attention in recent years as policy makers, businesses and working people across the UK get used to the idea that more of us need to work for longer to take account of the fact that more and more of us are living longer and that this reality comes at a cost. As things stand, by their mid fifties, many people are not in work because of early retirement, long-term sickness or disability, being or becoming unemployed or because they are long term homemakers. So the onus for working longer tends to fall on those who stay employed through all or most of their lives. But could more be done to encourage and support those most likely not to be working at 55 to do so and then to continue to do so? Looking right across people’s lives to track what may have influenced a person to leave or not be working at 55 provides us with a much clearer and more nuanced picture than a simple snapshot in time. We wanted to see whether having poor mental health as a child or as an adult might be an important part of that picture and give us some ideas for interventions that could extend the working lives of this group of people in a way that would benefit them and society more widely. It’s fair to say that the Government’s ambitions to get more people working for longer have been laid out quite clearly already, as has their commitment to putting people’s physical and mental health on an equal footing. Saying that, their commitment has been called into question recently in a report from The King’s Fund, which says parity is a long way off. When it comes to specific groups not working, the Department for Work and Pensions has tended to focus its attention on benefit claimants rather than other groups who, for one reason or another may choose not to work – housewives and husbands for example. Government initiatives to try to help people with mental health problems find work have included the ‘Improving Access to Psychosocial Therapies’ (IAPT) programme, which has increased provision of therapies for benefit claimants with depressive and anxiety disorders. Evaluations of IAPT suggest that ‘Nationally, of [adult] people that finished a course of treatment in IAPT, 45% recover. . . and a further 16% show reliable improvement’. Encouraging results that have led to modest increases in employment, and it’s hoped there will be more positive news on this front. However, things don’t look quite so encouraging when it comes to younger people with mental health problems and that’s what our research is shining a spotlight on. It’s also an area we believe should be a focus for policy makers and those working with young people including parents and schools. After all, successfully extending people’s working lives can only be done once they successfully enter and then remain in employment. This is less likely for youngsters with poor mental health. We used information from the National Child Development Study which has followed the lives of thousands of people born in 1958, and collected detailed information about their lives and circumstances. This included their employment situation and, first and foremost, we were able to see that, at age 55, nearly 19 per cent of the 9,000 participants in the study were not working: 2.8 per cent were unemployed, 5.2 per cent were permanently sick, 3.3 per cent were retired and 7.5 per cent were homemaker/other. From a very young age, the study also collected information on whether the individuals in the study exhibited signs of depression or worry, whether they were hostile, disobedient or aggressive. Even when we took account of a wide range of other things such as whether they suffered poor mental health as young or older adults, numbers of other children in the household, whether their partner was employed, qualifications etc. the association with problems as a child were still really strong. Drilling down into whether those mental health issues were ‘internalized’ or ‘externalized’, we were able to see that those who were depressed or anxious as children were about one and a half times more likely to be unemployed or permanently sick as their peers without problems. It was a similar story for those who had shown externalised signs such as aggression. They were more than twice as likely to be unemployed or permanently sick, and also more likely to fall into the homemakers/other category too. Interestingly there was no strong link between poor mental health in childhood and taking early retirement or being employed part-time. Of course there is a lot more at play in children’s lives than we have taken account of in this study. Nevertheless, it is clear from our research that addressing the mental health problems of the very youngest in society could and should be an area for focus and schools, together with parents and those with a responsibility for the wellbeing of young children have key roles to play here. It seems it is never too early to intervene proactively to try to help young people get and stay on a healthy happy path that will lead to them a productive and satisfying working life that extends well beyond the age of 55. Equally, given that people identifying themselves as ‘homemakers’ rather than unemployed are the largest group not working at age 55, policy makers could consider ways to get this economically inactive group into the workplace, in tandem with its efforts to support the mental health of those people on benefits. There is also a message here for policy makers about just how important it is to make those promises about parity of esteem between mental and physical health a reality sooner rather than later. Impact of childhood and adulthood psychological health on labour force participation and exit in later life is research by Charlotte Clark and colleagues and is published in Psychological Medicine. The research is part of the ESRC funded Research on Extended Working Lives (RenEWL) programme at UCL. This entry was posted in Journal article and tagged 1958 Birth Cohort, Ageing, Career, Disability, Employment, Flexible working, Health, Jobseekers, Mental health, National Child Development Survey, Pension, Retirement, State Pension Age, Stress, Well-being, Work on March 20, 2018 by Chris Garrington. Staying at work longer – a matter of geography? There are lots of reasons why people end their working lives early, and the relationships between those reasons are complex. We know, for instance, that if you’re a carer for someone close to you, if you’re unwell yourself or if you don’t have higher level qualifications then you’re more likely to stop working sooner. But how does the area in which you live affect your prospects of working for longer? What if you live in an area of high unemployment, for instance? A new report by George Holley-Moore and colleagues at the International Longevity Centre – UK highlights how people in such areas are less likely to extend their working lives – even when those other factors are taken into account. All too often the debate about how best to help people to work into later life stops at physical health. But research from the renEWL project suggests there is much more to be considered. In a new report, Working for Everyone – Addressing Barriers and Inequalities in the Working Lives Agenda, we look at these complex relationships – and we find there’s a great deal more policymakers could be doing to help. Interlinking factors such as physical and mental health, working conditions, family life and lifestyle are all important. And it’s vital that regions should use their devolved powers to ensure that people in all parts of the population have the opportunity to extend their working lives. But how does where you live affect the length of your working life? We know older workers living in areas of high unemployment tend to leave work earlier: A study by Emily Murray and others looked at a one per cent sample of the population, aged between 40 and 69 and working in 2001, and at the same sample again 10 years later. Using local area statistics on unemployment, it mapped whether they left work, and their reasons for leaving, against the level of joblessness in their area. It found that people who rated their health as poor in 2001 were almost six times more likely not to be in work 10 years later. 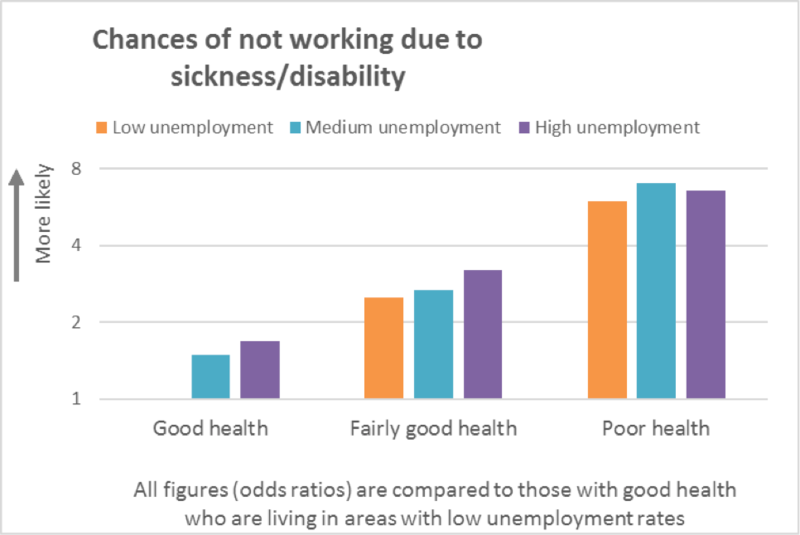 Thinking about this, it’s perhaps unsurprising that older workers in areas of high unemployment were less likely to be in work 10 years on – after all, if you live in an area with high unemployment you’re more likely to suffer from a long-term health issue. And that’s bound to affect your ability to work. Furthermore, if you have poor health earlier in life you are more likely to be sick or disabled later in life. But was there a geographical factor even after these health inequalities were taken into account? Murray and colleagues found that even those in good health were more likely to be out of work a decade on if they lived in an area of high unemployment – that is to say, this economic factor operates separately from all those other things that can affect the length of a person’s working life. People in poor health were more likely to be out of work regardless of where they lived. National Government should focus infrastructure spending on areas of higher unemployment with a view to increasing job opportunities and making employment more accessible for older workers. Regions need to use devolved power to tailor their own integrated strategies to enable fuller working lives. Local authorities should be given power and funding to coordinate local partnerships that tackle employment challenges. These should include councils, businesses, health and social care providers and charities: supporting fuller working lives in at-risk areas would require a joined-up approach that targets the various at-risk groups. Fundamentally, policy must move away from focusing exclusively on physical health conditions. We need a holistic approach which incorporates physical and psychological health, growing care needs and socio-economic disparity if we are to extend working life for everyone. This entry was posted in Journal article and tagged Census, Disability, Geography, Health, Retirement, Sickness, State Pension Age, Unemployment, Well-being, Work, Working longer on March 8, 2018 by Chris Garrington. As more of us work for longer, it’s important to recognise the needs of older workers: and that includes the fact that as we age we are more likely to suffer from long-term illnesses. To what extent do our working conditions affect our decisions about whether or not to continue in a job despite having a chronic disease? Maria Fleischmann, research associate in the Department of Epidemiology and Public Health at University College London, has been asking what might help to prolong working life for older people. Could factors such as having supportive colleagues and managers, or a clear understanding of who does what, make a difference? There is strong evidence that people with long-term illnesses leave work early. While three quarters of healthy European 50-somethings have jobs, the figure from those with chronic disease is much lower. Among those with one condition such as diabetes or heart disease, the employment level is around 70 per cent – and for those with two or more that drops to around 50 per cent. Conversely, those who are able to stay well are significantly more likely to continue working beyond pensionable age. As our working lives grow longer, it’s important to acknowledge that older workers with chronic diseases may have different needs from those who are well – they may not be able to work such long hours, for instance. So, what are the factors that can make a difference? We know, for instance, that people are likely to remain in work for longer if they have a high level of control over their own hours. Shift workers, on the other hand, are more likely both to become unwell and to leave work early. But what about the factors that are harder to see? What about a worker’s sense of his or her own job stability, or of how harmonious the relationships are between co-workers? Does it help if an employee feels he or she generally knows who does what, or how to respond to a given situation? These types of factors – collectively known as ‘psychosocial factors’ – are also believed to affect peoples’ decisions about whether to stay on at work. We used data from the Whitehall II study, which has been following the lives, work histories and health experiences of just over 10,000 London-based civil servants since the mid-1980s, when they were all aged 35-55. We looked at the participants in mid-life, around 14 years before retirement age, to see how factors such as levels of autonomy and of support from supervisors or co-workers might affect their decisions if they became ill with diabetes, coronary heart disease, stroke or malignant cancer. And we found that while good ‘psycho-social’ working conditions were helpful generally in supporting workers to stay on in their jobs, they didn’t appear to make any extra difference for those who became ill. The participants in the Whitehall II study were asked questions such as: ‘Do you have to do the same thing over and over again?’ and ‘Do you have a choice in deciding how to do your work?’ They were also asked whether they felt they had good support from colleagues and superiors and how demanding they felt their job was. They were also asked to describe their level of education, their mental health and whether they had a partner who worked. We were able to use their answers to assess whether these factors made a difference when they developed illnesses later in life. We could see that six out of 10 participants left work between the first phase of the study in 1985 and the last one used for this study, in 2007-9. During the same period the proportion suffering from chronic illness had increased from less than two per cent to almost 30 per cent. So why had they left, and how might those ‘psychosocial’ working conditions have affected those decisions? Among the whole group of participants, we found clear evidence that those who felt they had reasons to be happy in their work were more likely to stay on. Specifically, those who felt they were using a wide range of job skills – known as skill discretion – and those who felt they had good social support at work were more likely to stay on for longer. However, we did not find evidence that those ‘psychosocial’ factors would make more of a difference in whether or not a worker stayed on if he or she were chronically unwell. Or rather, good working conditions were equally important for workers both ill and well. So, we know that good social and psychological conditions at work are likely to be helpful in keeping employees at work as their careers near their end. And we know that chronic illness is a major reason why people leave work early. But from our study, we cannot say that such good working practices will be a particular deciding factor for those who become unwell. There were some interesting factors in our results: first, we were able to look at the different ways in which people left their jobs, and the reasons why they did so. So those who used a wide range of skills had a reduced risk of leaving work earlier through retirement or ill-health, but this was not related to the risk of leaving work earlier through unemployment; while those who had good social support had a reduced risk of leaving earlier through ill health or unemployment, but not so much when we looked at leaving earlier through retirement. And while previous studies had tended to measure working conditions at the time of leaving, ours looked at those conditions several years beforehand. There is certainly scope for more detailed research on this issue – and there is plenty of reason for both researchers and policy advisors to continue to focus on how employers can help chronically ill workers to stay in their jobs. Can favourable psychosocial working conditions in midlife moderate the risk of work exit for chronically ill workers? A 20-year follow-up of the Whitehall II study is research by Maria Fleischmann, Ewan Carr, Stephen A Stansfeld, Baowen Xue and Jenny Head. It is published in the BMJ Journal of Occupational and Environmental Medicine and is part of the renEWL project on Extended Working Lives. This entry was posted in Journal article and tagged Ageing, Career, Diabetes, Disability, Employment, Flexible working, Health, Heart Disease, Mental health, Occupational health, Pension, RenEWL, Retirement, State Pension Age, Stress, Unemployment, Well-being, Whitehall Study, Work on February 5, 2018 by Chris Garrington. Why retirement might not be as stress-free as you hoped! Ahhhh retirement: finally time to relax, enjoy life, unwind and feel less stressed. That is certainly how many people will be expecting or hoping that their retirement will pan out when it happens. But research by Tarani Chandola from the University of Manchester and colleagues at UCL and the University of Essex, shows that whilst dreams of a less stressful life in retirement may come true for those in higher status jobs, they are less likely to do so for those in low status occupations. Here he explains the research, which uses innovative methods to see whether retirement really is the stress buster many of us hope it will be. We have known for some time that people from poorer backgrounds in low status jobs generally have poorer health across their lives and tend to suffer from greater levels of stress. Those health inequalities widen as people get older, but it had been assumed that retirement might see a closing of the gap, because poorer workers have higher levels of work stress, but this appears not to be the case, something that researchers have found hard to explain. As most countries are now raising retirement age and, with it, the age at which workers can collect their State Pension, it is really important that we understand the impact these policies might have on the health and wellbeing of employees, particularly those in disadvantaged working conditions. In this research, rather than just making use of self-reported health information from workers, we wanted to get right under their skin to look at what signs of stress there were in their bodies in the run up to and after retirement. We wanted to compare the stress levels of those who had just retired to those still in work and we also wanted to compare the stress levels of workers in high and low grade jobs. We were able to do this by looking at the changing levels of a stress related hormone called cortisol. Our information came from The Whitehall Study, which has tracked the working lives of thousands of UK civil servants since the 1980s. As well as being a good fit for the research because of the type of information available, using a longitudinal survey like this enabled us to observe the same people over this important period of in their lives. We focused on just over 1000 of the study’s participants who were aged around 60 and who, as part of the Study, provided a series of saliva samples across a day. Using these saliva samples, we could measure their changing levels of cortisol over the day. Waking up in the morning results in the release of cortisol, which declines to almost negligible levels by bedtime. The steeper the declines in a person’s cortisol measurement across the day, the less stressed they were. People with relatively higher levels of cortisol at bedtime are more stressed and have a flatter rate of decline of cortisol. Their employment grade was categorised as ‘high’, middle or ‘low’ according to the civil service banding system. Civil servants who were employed in the lowest status jobs had the highest levels of stress, whilst those in the highest status jobs were the least stressed. We could also see that, after retirement, when we might have expected biological stress levels to fall for all the workers, this was only the case for those in the top jobs. Lower grade workers who had just retired were just as stressed as their peers who were still working. Worryingly, far from being a time when the stresses and strains of working life melt away, retirement seems to bring little or no relief for those in lower grade occupations. It seems the health inequalities observed between those in high and low grade jobs are magnified not only as workers get older, but even in retirement, when we might think the opposite would occur. In other words, at a time when the gap might be expected to close, in fact it widens. It’s important to note that we took a wide range of other factors into account when we looked at the lives of the people in the study, including their broader health, whether they had a serious life-limiting illness, whether they were married etc., but our results remained strong, giving us considerable confidence in our findings. Of course, there can be many different factors at play as we prepare to retire. Workers who retire from low status jobs often face financial and other pressures, whilst their better paid peers enjoy good pensions and have the resources to engage in leisure and social activities. Another key point to make is that if this is the picture for people working in the civil service, where working conditions are considered very good and certainly a great deal better than most other employment areas, things are likely to be worse in other types of job where working conditions are less favourable. For those looking to tackle inequality and unfairness in the workplace and wider society, our findings add to a growing body of evidence of how they are magnified across the lifecourse. They serve to remind us also that if we want everyone to enjoy a relaxed, happy and fulfilled retirement, then those inequalities must be addressed early with policies that are based on solid evidence. This entry was posted in Journal article and tagged Ageing, Career, Civil Service, Cortisol, Employment, Health, Pension, Retirement, State Pension Age, Stress, Well-being, Whitehall Study, Work on July 27, 2017 by Chris Garrington. When we think of why someone might retire early, our minds are unlikely to make the leap to their childhood for the answer. But a group of researchers interested in what sorts of things affect our later working lives, believe that early retirement may indeed have some of its roots in our younger years. The research sheds new and important light on worldwide efforts to plug pensions gaps and get more people working longer. Hanno Hoven from the University of Dusseldorf outlines why he and colleagues from the International Centre for Lifecourse Studies at UCL think early retirement can be traced right back to having had a tougher childhood. He goes on to explain what the findings might mean for policy in this area. All sorts of things are likely to influence the point at which older people stop working. External factors like tax incentives to stay in work or changes to when we can claim our State Pension play a role. Then there are our working conditions, what’s going on with our health and how our personal circumstances change as we get older. A substantial body of research has shown in recent years that people whose socioeconomic circumstances are poor are more likely to retire early than their better off peers. But in our research, we wanted to see if retiring early can additionally be traced back to earlier stages of the life course, more specifically, to having had a tougher life as a child or during mid adulthood. In addition we wanted to dig a bit deeper into older people’s working lives, by giving a clearer and more detailed picture that describes entire patterns of employment trajectories (and not retirement timing only). To do this, we took into account the employment history between 50 and 70, including details on type of job people did, whether they worked full- or part-time or whether they were self-employed. We used information collected by the Survey of Health, Ageing and Retirement in Europe (SHARE), which has carried out interviews with more than 28,000 older people from 14 different countries. For our research, we focused on 5,857 men and women from the survey who wereaged 70 or over and who had provided details of their previous working and personal lives. 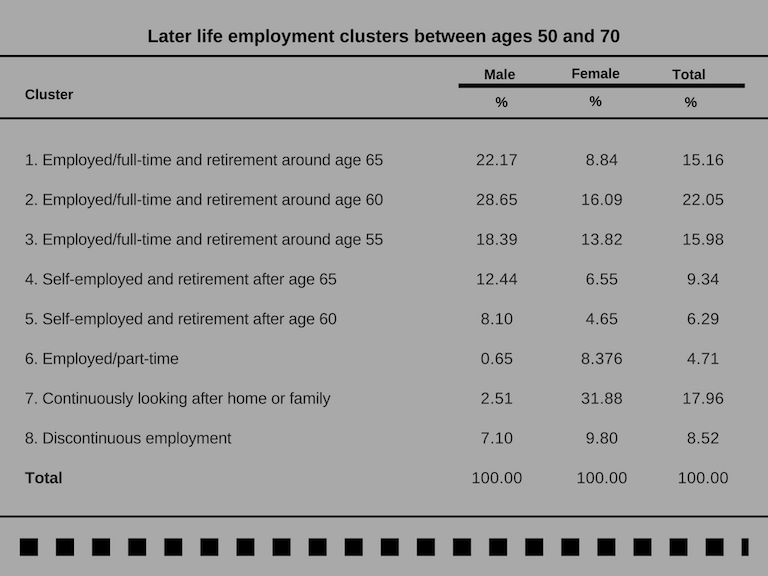 We created clusters of their work and employment histories, and you can see in the table below the proportion of men and women in each cluster. On this basis we could link these clusters or types of employment histories to earlier adversity for both men and women. Looking at types of employment histories between the ages of 50 and 70, we could see that men were more likely than women working in full-time employment or self-employed.. Women worked more likely in a part-time job or looked after home or family during those years. After modelling the effect of early life information and taking a range of background factors into account (e.g., among others, health conditions prior and during working life in mid adulthood), we were able to see that men who had experienced adversity in childhood were 5 percentage points more likely to have retired early (around age 55) from full-time employment, but they were less likely self-employed in late life. The same was true of men who experienced adversity in adulthood, although it is important to note that the effects were independent of each other. Women who had suffered adversity in childhood were also less likely to be self-employed and retire later on. However, it was not related to early (around age 55) retirement from a full-time job. Women who faced adversity in adult life were more likely to work part-time or to look after the home/family than their peers who suffered no adversity during that period. This was not the case for childhood adversity. Some other interesting things emerged from the research, which we believe provides a more comprehensive picture than has been provided before. One very notable point was that early retirement was more closely associated with being in full-time employment rather than being self-employed. This could be because employed people have more restricted opportunities to work for longer (even if they want to) compared with their self-employed counterparts who have more freedom in deciding when to retire. For those, including the Government’s Business Champion for Older Workers, who want to see thousands more older workers in British companies by 2022, this will be food for thought. More flexible retirement arrangements are likely to be necessary for employed workers who want to work longer, for example, through retirement schemes that allow a reduction of working time before leaving the labour market. This argument is further supported by the fact that such a cluster (where employed people reduced their working hours before retiring) was not found in our research. Interesting differences emerged between men and women when it came to their employment histories and the way in which childhood adversity was linked to them. Whilst men were more likely to follow a path of full-time employment into retirement, women were more likely to have been continuously looking after home or family (without retirement) or have worked part-time. When we factored in childhood adversity in the women’s lives, there was a close link with discontinuous employment in later life. This link was stronger for women than for men. Other research has suggested that traditional gender roles make it harder for women to gain a foothold in the labour market, a disadvantage that any adversity in childhood is likely to compound. Looking across the lifecourse in this way sheds considerable new and important light on the timing of retirement, and offers some pointers for policymakers looking to increase the numbers of older workers. One specific implication is that certain measures are likely to work better for different age groups and should address different stages of the lifecourse. There has been a great deal of focus on pension age and working conditions for older people. However, our research suggests that our childhood circumstances are also important and that policies to tackle childhood poverty and create good stable jobs for young people may also have a key role to play over time. Early Adversity and Late Life Employment History—A Sequence Analysis Based on SHARE is research by Hanno Hoven, Nico Dragano, David Blane and Morten Wahrendorf and is published in Work, Aging and Retirement. This entry was posted in Journal article and tagged Ageing, Career, Childhood, Employment, Family, Flexible working, Health, Mental health, Pension, Retirement, State Pension Age, Survey of Health Ageing and Retirement in Europe, Unemployment, Well-being, Work on June 14, 2017 by Chris Garrington.